What the heck do vegans eat? Pesto! | Mmm, Tasty! What the heck do vegans eat? Pesto! Posted in cooking, CSA, What the heck do vegans eat? Here’s another look into what I make on a pretty typical evening. We got a wonderful bunch of kale, some garlic, and some tomatoes in our latest CSA share, so I immediately thought pasta would be wonderful. I just scored an old (but still in great condition) Cuisinart food processor at a yard sale, so I wanted to make up a pesto to go on said pasta. But my basil plant was looking a bit sad, so that was out. Have no fear – kale to the rescue! This is a kale pesto made with chopped kale (with the most woody stem bits removed), several cloves of garlic, pine nuts, nutritional yeast, olive oil and salt and pepper to taste. To that I simply added some chopped tomato and served it over corn pasta. 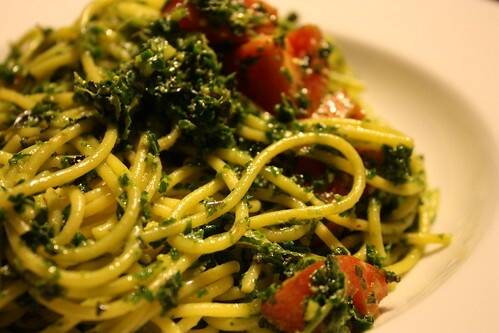 If you don’t try to avoid gluten, you could easily serve this over any vegan pasta you like.